there is sometimes a color shift that occurs when viewing reflective vinyl in different settings. Reflective vinyl is not self luminescent. Its properties aren’t apparent in normal daylight conditions. It’s specifically designed to be visible at night when stricken with artificial light such as that from motor vehicle headlights. This reflective property is what makes road signs legible after dark without the cost of electric illumination. Because of this, there is sometimes a color shift that occurs when viewing reflective vinyl in different settings (fig 1). White reflective for instance, is only white when it’s doing its thing. In normal daylight settings, it tends to look slightly grayish or pearlescent At the other end of the spectrum, black reflective has to look different when light hits it because black is the absence of light. So black reflective looks brownish when it reflects light after dark. 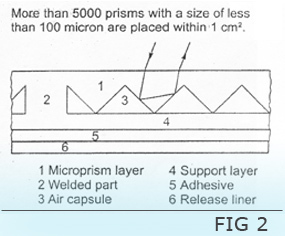 Prismatic reflective film is made by layering small prisms in the face film. Upon close inspection these would look like tiny pyramids in the vinyl. Not all reflective vinyl is the same. There are two basic kinds, usually characterized as retro-reflecitve, and prismatic. These are further segmented into different Types and grades determined by their construction and reflective properties, which we’ll examine in a moment. Retro-reflective is made by mixing glass beads in the pigment of the face film. The embedded beads reflect light back toward the viewer when illuminated. Therefore retro-reflective film is also referred to as beaded reflective. These embedded beads make retro-reflective sheeting more difficult to cut than standard PVC vinyls. Always use a 60o blade when cutting retroreflective sheeting. You can make it work with a 45o blade and lots of force, but that blade will be worthless when you’re done. Prismatic reflective film is made by layering small prisms in the face film. Upon close inspection these would look like tiny pyramids in the vinyl (fig 2). Just as a prism splits and reflects light, prismatic reflective film reflects light back through the face film toward the viewer. This densely layered construction makes prismatic reflective sheeting even more difficult to cut than retro-reflective film. Some brands such as 3M 3930 Diamond Grade, can only be cut with a Pro Series cutter using special blades and well over 400 grams of force. If your 3M vinyl is wider than 24″, you may need to add a pinch roller to your plotter. The amount of cutting force applied to cut the film can cause tracking problems. Extra pinch rollers help keep the media aligned properly. Other brands like Nikkalite’s Crystal Grade reflective cannot be cut with anything less than a flatbed cutter. It can be scored with a Pro Series plotter, but the cutting must then be finished by hand. The advantage of prismatic film is that the sides of the prismatic cells in the face film bounce light back at wider angles. This results in much more light being reflected back toward the source and makes the light visible from a wider viewing angle. This is especially useful in highway signs, which is why prismatic sheeting is the specification for this application. You can pore over a complete chart of measured reflectivity, or just make sure the vinyl meets an industry standard called ASTM D4956. There are standards of reflectivity that grade the effectiveness of different films. These standards form the basis of government regulations and specifications controlling the use of reflective vinyls. The amount of light reflected by reflective vinyl is measured and reported in a number called cd/lux/m2. In lay terms, it’s the reflected light measured in candlepower taken at various viewing angles. If you wanted to compare reflective vinyl based on its visibility from different angles you would look at this value. EnduraLITE Super Engineer Grade white reflective vinyl for instance has a rating of 185 at an observation angle of 0.2o. Comparatively, ORALITE 5700has a rating of 100 and ORALITE 5800 is rated at 250. Of course, these are for white. Colors will have lower ratings. Technically if you wanted to compare vinyls based on candlepower you’d have to look at various observation angles and at various angles of entrance (Remember these are designed to simulate real world conditions. Rarely do you have the luxury of reading a road sign on a dark night that’s directly in front of you. If it were, you would read it, then run into it). 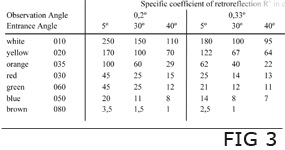 A complete chart of measured reflectivity can be found in the product data sheet of any reflective film (fig 3). But rather than pore over these numbers, you can just check to make sure that the vinyl you have in mind meets an industry standard called ASTM D4956. ASTM is an international standards organization originally known as the American Society of Testing and Materials. ASTM standards are used to evaluate thousands of products. The D4956 standard is the Standard Specification for Retroreflective Sheeting for Traffic Control. So if a vinyl meets the ASTM D4956 standard, you can safely sell and install it for street signs. However, there are ten types referenced in the D4956 standards that cover different applications and levels of reflectivity. Types I, II, and III are different types of retro-reflective films. Types IV – X are prismatic constructions. Before you buy your vinyl, make sure you know the specification required. For a complete list of the Types of reflective sheeting, visit the Manual of Traffic Signs. Once you’ve identified the category of reflective sheeting you need, there is one more critical choice to make. This one’s a little more difficult because there isn’t a consensus. Different manufacturers use varying labels called ‘grades’ to promote the quality of their reflective vinyls. ORACAL offers its ORALITE films in commercial grade and engineer grade. Avery offers “utility”, engineer, and super engineer grade. EnduraLITE is available in engineer, flexible engineer and super engineer grades. How do you choose the right product? To simplify the choice, don’t pay too much attention to the ‘grade’ label applied to the film. Look instead at outdoor durability rating and flexibility. The outdoor rating is easy as most films tell you what to expect. They generally range from three to seven years outdoors, although the newer Type II “super engineer” grade reflective films are now rated at ten to 12 years. That leaves conformability as the last critical factor. This is important because reflective vinyl is not made from the same PVC compounds used in calendared and cast films. It’s made from translucent acrylic resins designed to allow the light to pass to and from the enclosed beads or prisms. This face film can be rather brittle and some films that are seven year engineer grade products will not work on anything but flat surfaces. They’re great for street signs, not so great for police and emergency vehicles. This usually causes problems when someone chooses a non-conformable reflective for fleet applications. The film sticks for a while, then begins to release from the curved surfaces. Having your newly applied graphic fall off the Sheriff’s cruiser can be bad for your career. So make sure you check that spec. The SignWarehouse catalog, page 79 makes it easier by defining which reflective vinyls are conformable and which are not. You can order online by using this link. Now that you know how to choose the right reflective product for your needs, we need to talk about application and printing. The most common error in applying reflective vinyl is the use of application fluid. This is a big no-no. The adhesives used in these products do not stand up well when applied wet. The use of any application fluid, whether it’s dish detergent or RapidTac will probably cause the vinyl to fail. Always apply reflective films dry. 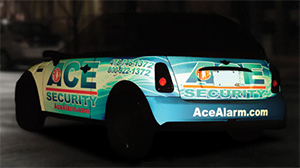 The inclusion of reflective graphic elements in commercial vehicle wraps is expanding the appeal of reflective sheeting well beyond the traditional segments of municipal signage and emergency vehicles. This trend has sparked a lot of sign makers’ imaginations resulting in lots of questions about whether reflective vinyl can be imprinted. The answer is a qualified yes. If you’re using an old fashioned thermal resin printer, you can print on most reflective vinyls, although some of them may not hold the resin as well as others. If you’re using a solvent or eco-solvent inkjet, you can print on some reflective vinyl, but not all of it. Our EnduraLITE 8100 is a popular choice for ValueJet and PrismJET VJ users. ORALITE 5300 and 5600 are also solvent printable, but 5700 is not. 5300 is a non-conformable film not recommended for vehicle graphics and fleet marking. For best results, we recommend EnduraLITE M8512, a 6.4 mil Type 1 retro-reflective film developed specifically for use with solvent and eco-solvent inkjet printers. EnduraLITE M8512 is a conformable, seven year film meeting ASTM D4956 and E-810 standards for visibility and reflectivity. For printing on a PrismJET VJ48 or MUTOH ValueJet, use an ICC profile for glossy vinyl and set the platen and pre-heaters to 40° and 45° respectively and set the drying temperature at 50°C. There are also digitally printable reflective options from ORACAL and Avery. 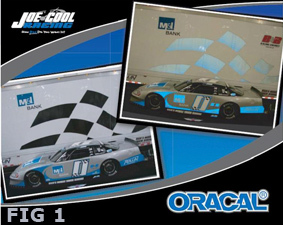 Oracal’s ORALITE 5650RA is a white reflective film with ORACAL’s Rapid Air air egress liner to aid bubble-free application of large vehicle graphics. As is the case with most air egress films, it comes with a higher price. But, if you’re installing a large panel or sign, air egress channels can be a lifesaver. 5650RA comes in 30″ and 48″ widths, starting at $314.95 for a 30″ x 10 yard roll. Click here to order. As your business grows, you’ll have opportunities to sell and install municipal signage or fleet marking for local police departments and emergency vehicles. Be prepared for these important customers. Make sure you get the specs. Then choose the right type and level of reflective sheeting, especially if you intend to print the job. Apply it dry and on the right surface following the manufacturers guidelines. Professionally installed municipal signage will help your community thrive and reflect positively on your business.